CINCINNATI, OH, — Cinncinati Reds fans will now have the opportunity to meet former Cincinnati Reds outfielder, Ken Griffey Sr., who is scheduled to sign copies of his new book, “Big Red” at three different locations in Cincinnati, Ohio. 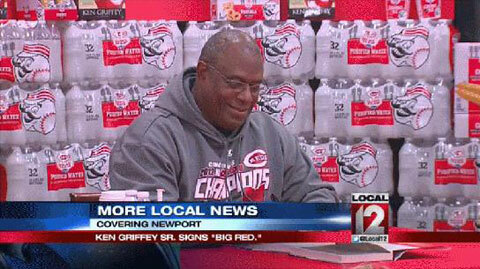 Photo shows Ken Griffey Sr. signing his new book “Big Red” April 2014 at the Newport Kroger. LAS VEGAS, NV. — Former NFL running back, Emmitt Smith, is set to meet his fans and sign autographs over the next six months at the Field of Dreams Store located in Las Vegas. 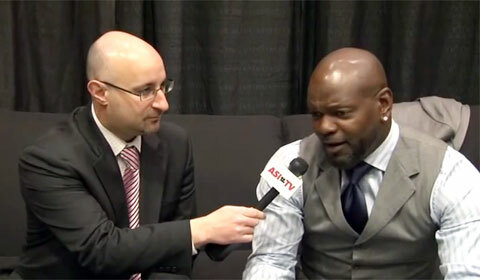 Photo shows shows former Dallas Cowboy’s running back, Emmitt Smith, speaking with counselor editor Andy Cohen after his keynote speech at the ASI Show in Dallas in February 2013. MARLBOROUGH, Mass. — Former Boston Red Sox catcher and MLB Hall of Famer, Carlton Fisk, is scheduled to meet fans and sign autographs on July 30 through August 3 at the Royal Plaza Trade Center located in Marlborough, Massachusetts. Fans will have a rare opportunity to meet Fisk and see the creation of a unique piece of memorabilia for their collection. 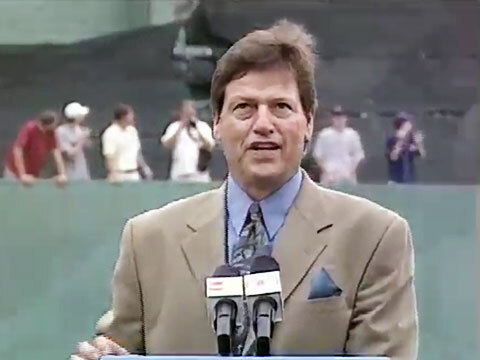 Photo shows Carlton Fisk speaking on Sept. 4, 2000 as the Boston Red Sox retire his number. MURRELLS INLET, S.C– MLB Hall of Famer, Wade Boggs, made an appearance on Saturday, April 5, for a charity event held at the Grand Opening for Murrells Inlet Outpost in Murrells Inlet, S.C. Before the event began, Boggs signed a few items for fans that would eventually be auctioned off live along with other items to benefit Hands of Hope Charity. Photo shows MLB Hall of Famer, Wayne Boggs, with a fan at the April 5, 2014, Murrell’s Inlet Outpost Grand Opening charity event benefiting Hands of Hope Charity. 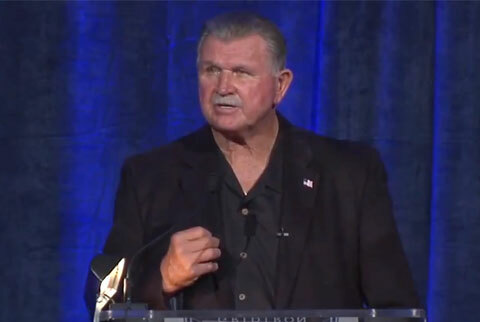 Las Vegas, NV — Former NFL coach, Mike Ditka, along with “Mean Joe” Greene, Kyle Turley and other NFL stars will come together to raise funds for retired NFL players on June 6 – 7 at the 2014 Gridiron Greats Assistance Fund Hall of Fame Dinner and Autograph Show. Photo shows former NFL coach, Mike Ditka, speaking at the 2013 Gridirons Greats dinner. ORLANDO, FL — In celebration of “Legends Nights,” former Orlando Magic legend and seven-time NBA All-Star, Grant Hill, was honored by the Orlando Magic at the end of the first quarter during the March 25 matchup vs. the Portland Trail Blazers. The evening featured a center court presentation at the end of the first quarter. Hill joined FOX Sports Florida’s broadcasts including Magic Live pregame show with hosts Paul Kennedy and Nick Anderson and join broadcasters David Steele and Jeff Turner for a portion of the game broadcast. 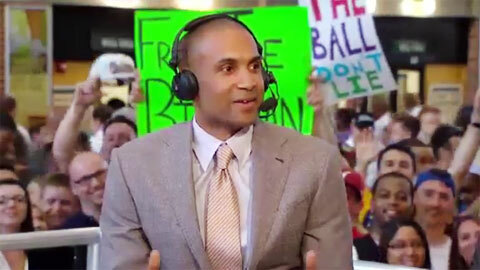 Photo shows NBA All-Star, Grant Hill announcing his retirement after 19 season in the NBA. 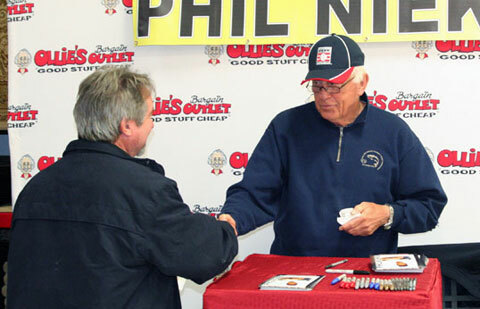 NEWNAN, GA. — Hall of Fame knuckleball pitcher, Phil Niekro, appeared at Ollie’s Bargain Outlet in Newnan, Georgia for the Newnan store’s grand opening on Weds, March 18, to meet an greet fans & to sign autographs. The event began at 10 a.m., but fans arrived at the store as early as 7:30 a.m. to get their tickets in order to to meet the former Atlanta Braves pitcher. Photo shows Phil Niekro signing autographs on March 19, 2014 at Ollie’s Bargain Outlet for the Grand opening of Newnan Stores in Newnan, Georgia. Photo Credit: Time Herald. WINNIPEG, Ca. — Former Cinncinnati Reds legend, Pete Rose, is coming to Winnipeg on Saturday, April 26, at a pay-per-autograph event at The Park Theatre where Rose will sign autographs from 11:00 a.m. to 2:00 p.m. Tickets for the event range in price from $20 to $40 and can be purchased through the Park Theatre, Music Trader or online. A ticket to the event will guarantee the purchaser a chance to meet baseball’s controversial MLB legend. 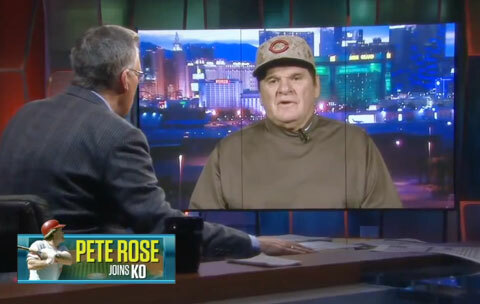 Photo shows Pete Rose speaking with Keith Olberman in October 2013 about progress on his MLB reinstatement, PED users in the majors and the 2013 World Series.